I’m aiming for the expert’s level in the 2010 Global Reading Challenge which requires me to read, among other things, two books set in Antarctica. It was surprisingly difficult to find anything other than testosterone-fuelled thrillers or sci-fi adventures for this setting so I was quite pleased to stumble across 2007’s In Cold Pursuit which is a genuine murder mystery for my 7th official book in the challenge. Valena Walker is a young glaciology graduate student who has secured a place on Professor Emmett Vanderzee’s Antarctic team. Unfortunately upon arrival in Antarctica she is told that Vanderzee has been arrested and taken back to the US and she too will have to leave as soon as there’s a spare seat on a flight out. Walker discovers that during the previous year’s work on the continent a journalist who was critical of Vanderzee’s work died from what was thought to be altitude sickness while on a visit to Vanderzee’s camp but now new evidence indicates the death was not an accident. Desperate not to leave Antarctica she decides to investigate the matter to see if she can determine what really happened. The standout feature of the novel for me was the picture it painted of life in Antarctica. Unlike other books I’ve read that are set there, the action in this one takes place in and around McMurdo Station which is a temporary home to more than 1300 people and I’d never really thought about Antarctica having its own small town before. With talk of ‘the season’, the need to haul in all the equipment and supplies one might need from half a world away and the competition between research teams for resources and kudos I was reminded of the many books I’ve read (fact and fiction) based in and around early archaeological digs in Egypt. I don’t know if the author has been there (her website says she was hoping to go there but it hasn’t been updated for quite some time) or has just spoken to people who have but she certainly made it seem very realistic and provided quite fascinating details of day-to-day life in the crowded isolation. Not surprisingly, because Andrews is a geologist and a professor, the scientific details and discussions about science-related issues such as global warming have an air of authenticity and add an interesting aspect to the book. As far as characterisations go I thought the best of these were at a group level rather than an individual one. We are shown the scientists (beakers), the tractor drivers (with their own very Pythonesque club), the administrators and so on and, as much as any group generalisation can be realistic, these felt quite natural and showed what kinds of people might be drawn to work in such a place and how they might react to the location. We don’t really get to know any single person other than Valena in any depth and for me this is a bit of a disappointment as I’d much rather get to know individuals. Valena is depicted quite realistically for the most part: generally strong with some credible glimpses of the uncertainties that a woman of her age would display in the kinds of stressful situations she encountered. I didn’t fall in love with her but liked her and wanted to see how things would turn out for her. The only part of the book that was a bit of a letdown was the mystery itself. Although there are the requisite number of suspects and red-herrings there really isn’t much in the way of suspense and for a good deal of the book there’s barely any action on the mystery front at all as we observe the day-to-day goings on at McMurdo. At times it felt like the author was trying to squeeze in all the interesting things she knew about living and working in Antarctica to the detriment sometimes of plot development. Although it’s not the best example of a mystery you will find In Cold Pursuit is a good read, especially for those with an interest in science. It hasn’t convinced me that any scientific knowledge humanity has gained from our presence in Antarctica will prove to have been worth the cost of finding the last pristine bit of the planet and covering it in buildings, vehicles and all the other detritus that accompanies us wherever we go but I did enjoy it as a unique reading experience. It appears that all of Andrews’ previous novels feature a forensic geologist and amateur sleuth Em Hansen, a character who makes a brief appearance at the other end of an email in this novel, and I enjoyed this one enough to seek out another book in this series. 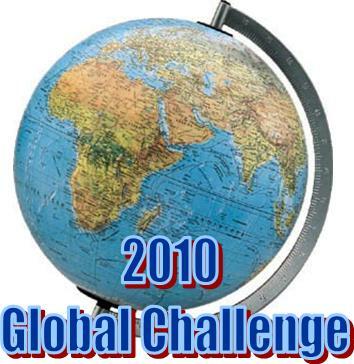 This entry was posted in Antarctica, book review, Global Reading Challenge 2010, Sarah Andrews. Bookmark the permalink. I have In Cold Pursuit in my TBR list for 2010 Global Reading Challenge. So I’m glad to hear that you have enjoyed it. My other Antarctica choice is Purgatory Road by Bob Reiss. Thanks for that tip Jose – I never came across that one in my hunting and it looks like a proper mystery too. I’ve read my two Antarctica books for the current challenge (the other one was more of a thriller) but I’ll keep that title handy in case we do this again next year. Bernadette – Thanks for this excellent review. I know what you mean about the mystery being the center of a story; I like that best, too. I will probably put this on my TBR list because of the way it depicts life at McMurdo. My father went to Antarctica many years ago during his naval service, and it would be really interesting to see how this adds to what I heard as a child. Oh thank heavens, Bernadette! I’ll look out for this one – and the one Jose mentions, thank you too Jose! Antarctica is a worse challenge for me than X and Z put together! Sounds interesting; I’ll have to be it on my ever growing list of books to check out. Nice review. I would have been keen as to try this rather than the Preston/Child sci fi-ish thriller I’m reading for my second Antarctica novel, but unfortunately I couldn’t find a way to quickly get my hands on a copy here. Pity. Will have to keep an eye out for it in future.